The Maureens can be found on this blog since 2015 and are a regular guest ever since. How can a band with the same name as my mother not catch my attention? The music proved a match. The Maureens is one of those bands that go out in search of perfect popsongs and come out at the other end a winner. The kind of band that ought to be all over the radio, but somehow in the musical world of 2019 is not. 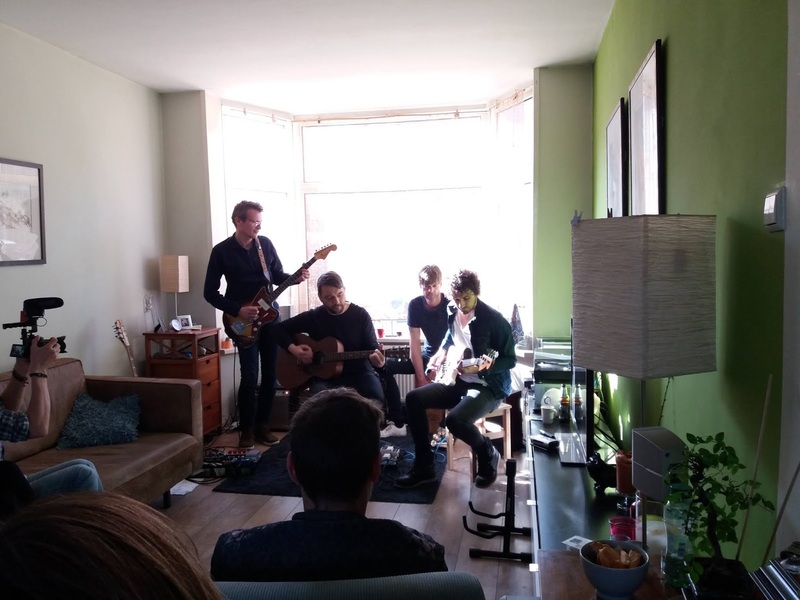 Put into a private setting of a living room, the band encountered the eyes of the audience as intimately as the audience eyes the band. "We can hear you listening", singer Hendrik Jan de Wolff said at a certain point in the show. And deservedly so. In an intimate setting like a private home show there's no hiding for band nor audience. Every detail is discernable putting pressure on the band to perform and on the audience to truly listen. And listen we did. Looking at the faces of the people around me intensely so. The impact was instant and clear to see. The Maureens were able to provide those little sparks of pure magic to all present. How snapping a finger and tinkling the little iron plates of a foot tambourine can create a rhythm, how wild guitar effects come through even when everything is turned down to one. But, above all, how melodies can affect people, not to speak of the three part harmonies that rolled over us on the other side of the room. As I wrote there is no hiding in a living room. Neither for a good song that can become even greater due to the intimacy. Several did. Exactly how good The Maureens' songs are, you can read about elsewhere on this blog. The same goes for the performances on stages. The band has added another aspect to its palet for me. This music lends itself perfectly for an intimate setting. I wish them the main stage of Lowlands and other festivals though. 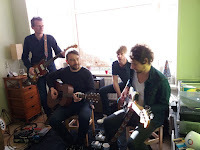 In that case I can say that I saw them in my own living room. Not one guest left without the feeling having been part of an experience, being warmed by beautiful music and the emotions that come with it. Thank you again, Hendrik Jan, Martijn, Stefan and Wouter. The whole show was filmed, so perhaps something will show up on the net somewhere.